Giddy Greetings: One World One Heart Winner! Congratulations to Micki Butler who won my giveaway. 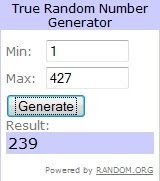 I can't believe I had over 400 entries in this giveaway! I gave a 5" Xyron Creative Station! You an see the original post with all the details here. Congratulations Micki on winning! It was nice to visit all the blogs. There were over 1,000 blogs participating in the giveaways. I have met some wonderful people along the way. I am looking forward to it again next year. Thank you Lisa for creating and hosting such a great event! See you all next year! Found out about this giveaway too late, maybe next time! Many thanks for taking part in our Valentine's Day giveaway! Remember to check back on Sunday 21 to see if you were lucky - Good Luck!! I am thrilled that I am the winner of the giveaway! I am so happy that I won your incredible giveaway. I just emailed you my snail address,so email me if you got it.